The Band’s first appearance on a national occasion came when it traveled by canal boat to Baltimore, accompanying the Pennsylvania delegation to the Presidential Convention in 1844 where Henry Clay was nominated for President of the United States. The Band performed at the original dedication of President Grant’s Tomb on April 27, 1897, in New York City. One hundred years later to the day, April 27, 1997, the Repasz Band performed for the rededication of Grant’s Tomb. At the conclusion of the official ceremonies, in which the Repasz Band was one of only two bands participating, the Repasz Band entertained hundreds of people with a concert of Civil War music. During the Spanish American War the Band played for the Pennsylvania National Guard from 1898 to the end of the war under the directorship of Herdic Wood (plus three enlistments between 1903 and 1912. In 1899, a spectacular pageant called "The Spanish War," featuring a cast of nearly 1,000 was performed in various locations by the Repasz Band. In 1903, the Band became the official band of the 12th Regiment of the National Guard of Pennsylvania, and marched in that capacity in the inaugural parades of Presidents Theodore Roosevelt in 1905 and William Howard Taft in 1909. In 1981, the Band played at the White House to celebrate its 150th anniversary. And it was this loyalty and enthusiasm of the players themselves that inspired the people of Williamsport lately to rally to the support of the old Repasz"3 when the Lycoming Opera House in Williamsport burned on May 31, 1915. The band had been based there and lost 84 years' worth of records and memorabilia, its music library, trophies, and most of its uniforms and instruments. Still the band filled an engagement the day after the fire, and in two weeks filled another with "all new equipment made in Williamsport." 2,3 As described in Edwin L. Suter's article, "Priceless Relics and Famous Library Destroyed by Fire," during the first year of its existence the Band began to gather a collection of music copied by hand into books for each instrument. In process the "library" of the Band grew to great size. It was said to be the largest collection of hand copied music in the country. It represented the work of hundreds of men . . . Groping among the ruins the other day Mr. Parker extracted an old singed, water-soaked book many years old. It was all that was recoverable of the famous "library." In the list of the burned notes of melody were seven sets of instrument books, leather bound and dating back to 1831, and reaching down to the seventies [1870s]. There was no such thing as printed band music when the making of these books was begun and there was no such thing for many years after. The musical collection of the Band grew with the organization. Another precious relic lost was a banner which the "lady friends" of the Band gave it in 1837. Back in the days of canal travel, the Band journeyed to Bellefonte by packet boat. Its musical achievements on that occasion were commemorated by the banner. Then there was an oil painting, Daniel Repasz and the Village Orchestra, by C. Lawrence, an original member of the Band in 1831, and it's first and only "brass" player at that time (French horn). There were also a baton and portraits of Captain W. N. Jones, one of the famous drum majors of Civil War days. The organization had sacredly preserved an ancient key bugle, the first brass instrument used in the Band by Daniel Repasz. Mr. Suter stated that "somewhere in the ruins there is probably a lump of brass representing the old time maker of melody. The late Herdic Wood, director of the Band for many years, had contributed to the list of things valued - the Lord's Prayer done in scroll work. The prayer represented the labor of various odd times that, pieced together, made a month of continuous work. It was destroyed by the flames. A massive cut glass vase, presented to the Repasz musicians by the Corning Band, of Corning, NY, was lost with the rest. The roster of the Band in Civil War days and other valuable records were burned. The Band had a collection of portraits and letters of prominent bands and great bandsmen of this and other countries. These represented Patrick Gilmore, John Philip Sousa, Innes, the Kilties of Hamilton, Ontario, and the "Bess o the Bairnes" from Scotland, and so on, and with them portraits and letters of commendation from United States Army and Pennsylvania National Guard officers. The art collection comprised about 200 pictures. They faded and shriveled in a minute in the furnace of flame that took possession of the band room. During the Depression, with nowhere to rehearse and no money to rent a room, the Repasz Band merged with the Elks Band. Many of the members played in both anyway, and the Elks offered a home. From the 1950s through the early 1990s, the Band became known as the Repasz Elks Band. In the late 1940s the Band languished. Rehearsals were held intermittently, and attendance was poor. The future was in doubt. A man named Earl Williams took on the task of saving the Band. Occasionally referred to as "Mr. Repasz,", Earl has been a member since 1938 (an impressive 65 years). Gene Bardo in "The Legacy of the Repasz Band" notes that when the Band was founded in 1831, there were no school bands, and the group was already 74 years old when the first high school band was founded in Connersville, Indiana, in 1905. Modern military bands and their music evolved over a long period of time and also includes groups like the Allentown Band. Since the time when Daniel Repasz molded his organization, others headed by such men as Patrick Gilmore, John Philip Sousa, Arthur Pryor, Edwin Franko Goldman, and Harold Bachman came, had their hey-day, and faded into history. Only the Repasz Band has continued its lineage and to this day looks forward to a promising future. Here is an article that originally appeared in the Williamsport Daily Gazette and Bulletin, Aug. 18, 1917, regarding the disbandment of the Repasz band as a military band. The apparently impenetrable maze of red tape which often hinders or nullifies movement of the war and navy departments may be the means of the United States losing the services of one of the finest military bands offered to the government. From the purest of patriotic motives and supportive tradition nearly as old as the organization itself, the Repasz Band with an enviable war record achieved during the civil strife of the sixties, got together a company of young musicians of proper age and physical development, rehearsed it to a satisfactory degree of excellence and offered it as a volunteer organization to any branch that might require the services of a first class musical organization. It was only natural that these young men desired to enlist as a body in which all being from one community and each acquainted with the other their friendships instead of being interrupted, would be continued and they would have, while serving their country, the pleasure of congenial companionships to make their stay on allied soil easier to bear. It seems however, that it is practically impossible for a volunteer brass band to even jimmy its way into the army or the navy. Here we have the anomaly of a great nation resorting to the draft to get an army and practically spurning the offer of a body of patriotic young men of eligible age eager to enter into the service of their country. It is acknowledged that the government needs bands, but there does not seem to be any one in either fighting departments who knows how to go about enlisting a volunteer organization, or if they do know, they seem to be afraid of the higher-ups responsible for the red tape business. 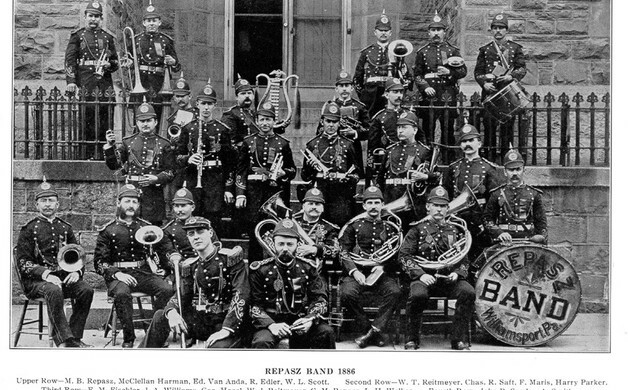 Ultimately, the members of the Repasz military band will find their way into various musical organizations of the service, but, scattered here and there, they will always be filled with regret because of the failure of a well thought-out plan to, as a body, do their country a creditable turn. The government will not only lose a good band, but the departments' responsibility for the failure will lose something in the estimation of the organization and the community of which it was the pride.